The grapes are carefully selected in the vineyard, hand harvested, placed in crates and carried over to the winery. If necessary, the temperature of the grapes and the grape must is immediately reduced down to 13- 14°C with the use of dry ice. The next step is carbonic maceration performed with dry ice for two or three days at a temperature of 10- 12°C . Then, the temperature is allowed to go back up naturally. At a temperature of approximately 12- 13°C the inoculation process is performed in the tank of local yeasts using a pied de cuve (or “fermentation starter”). The pied de cuve is prepared 3-4 days before, using the vineyards’ finest grapes and following the 4°C alcohol rule necessary for preventing apiculate yeasts from hindering proper fermentation. The length of the fermentation process varies depending on the quality of the pomace, and ranges from a minimum of 15 days up to a maximum of 30-35 days. During this time, maceration is enhanced by intervening mechanically to break the cap and push it under the surface, pump the wine over the cap, and rack and return. Then, Noble wines are aged in 5Hl “tonneau” casks and 30Hl wooden barrels, while Reserve wines are aged first in barriques and then in small 15Hl barrels, where weekly lees stirring continues. Noble wines stay in the “tonneau” casks for approximately 14-16 months, Reserve wines for a longer period of time that varies from 18 to 20 months. After aging in small- and medium-sized wooden barrels, the wine is transferred to large barrels then bottled. 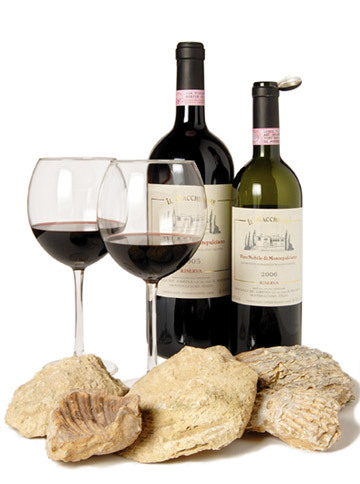 For Vino Nobile the entire wood ageing process is around 30 months while for Riserva it is 40 months. The bottling process begins once the wine is filtered with propylene cartridges, using a mobile system.